Do you know your piggy parts? Ribs are ribs, right? Can you tell your spare ribs from your St. Louis cut? Not all ribs are the same and their culinary contributions can vary. If you are little confused, let me help with some basic Piggy Primal Cuts. Keep in mind there can be regional differences in names and some cuts. Internationally, there are huge differences in the butcher shops. There are essentially three main cuts of ribs, some with more than one name. They are back ribs, side ribs, and rib tips. Starting at the vertebrae and working our way toward the belly of the tasty beast, we first have the back ribs. This section of the rib is below the loin (mmm, pork loin) and has a distinct curve. 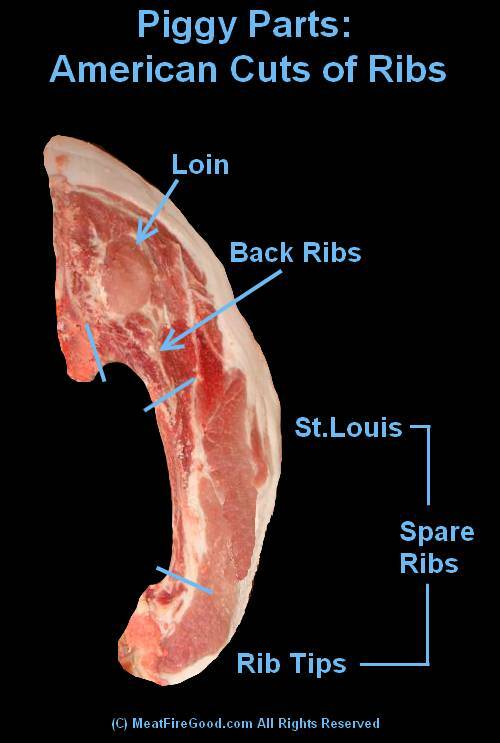 Back ribs are typically separated from the vertebrae and sawn from the remaining rib sections. Americans know this curved cut of pork from young pigs as the famous baby-backs. Tender and tasty! The next section of ribs are fairly flat ribs that come from the side of the pig. This rib section gets called “side ribs” and “straight ribs”, but “St. Louis Cut” has become standard. Whatever you call them, we are talking about more flavorful territory owing to the noticeably increased fat content. I like St. Louis cut ribs because they are full-flavored, easy to handle, and make a nice presentation. The remaining section closest to the piggy’s belly (and bacon, by the way), are the rib tips. The tips are the soft cartilagenous end of the ribs. Rib tips are full of connective tissue, are fatty and flavorful, but not everyone likes them or wants to deal with the cartilage. Those are the three sections of pork ribs. However, if you combine the last two sections, you get another cut of ribs: spare ribs. Spare ribs consist of the middle portion of the rib and the rib tips. These are popular in America’s backyard and picnic grills. This entry was posted in Cuts of Meat, Reference, Smoking & BBQ 101 and tagged baby back, butcher, chart, cross-section, diagram, food, fundamentals, meat, pig, pork, pork ribs, rib tips, ribs, Smoking & Barbecue 101, spare ribs, St. Louis Cut. Bookmark the permalink.